Virtu, the Wall Street trading giant, ended Friday’s trading session up nearly 7%. Investors have been pouring into the stock since a UBS analyst raised his price target for the firm. Virtu will likely benefit from a regulatory overhaul in Europe set to go live next year. 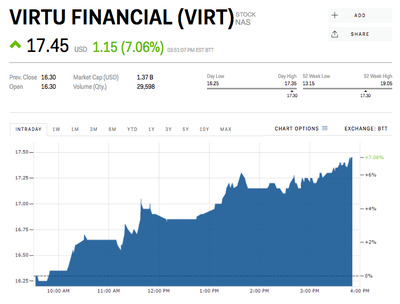 Virtu soared by more than 7% on Friday, a day after a UBS analyst raised his price target for the Wall Street trading giant. It gave up some gains by the end of the trading day, and closed at $US17.40 up 6.75%. UBS analyst Alex Kramm upped his target for Virtu from $US18 to $US19. He wrote in a note to clients Thursday that the trading firm has quickly moved in on opportunities to cut costs after its acquisition of KCG, another trading firm. As Business Insider previously reported, the speed and success of Virtu’s integration of KCG has caught Wall Street off guard. After the company reported results for the first time since the purchase closed, the stock soared more than 18% in one day. According to Kramm, Mifid II, a regulatory overhaul in Europe set to go live next year, could further benefit the firm. “The company’s increased presence in Europe should also allow it to better capitalise on MiFID II regulatory opportunities,” he wrote. Mifid II will create a new unbundled environment in which investment banks will no longer charge for their services – such as investment research and trade execution – in one bundled package. That could benefit trading firms like Virtu. The logic is clients of big banks will go to trading firms like Virtu for trade execution, which specialize more in such services.